The countdown begins. Eyes watch the ball drop. 3. 2. 1. Corks crack open, impale an uncle, and flutes fill with Champagne. It disappears just as quickly. But between the hugs, huzzahs, resolutions, and regrets, you wonder: was that $40 plus bottle of Frenchness worth it? It tasted fine. Maybe a bit tart, or a bit fruity, or a bit toasty. But memorable? Maybe it was too cold. Maybe the excitement distracted you. But we here at Wayward Wine blame New Year‘s Eve. We just opened a (relatively) low-priced Champagne (under $35). A fairly common fizzy Frenchy. It looked a clear pale gold. Bubbles raced up to create a head of fizz. Aromas were unexciting, with a cloying lemon tart and matches. The palate felt harsh, tart, and full of lemon pith and chalk. We tried it again, now adjusted to the acidity. Still lame. The moderate length also disappointed us. It seemed good, textbook, but hardly great. But then we remembered something. While in Paris last year, my wife and I caught wind of trend: decanting Champagne. Posh bistros would pour Champagne into carafes. That air time released a chunk of CO2, creating a softer, less aggressive fizz. Then the wine’s flavors and fruit could shine. And Champagne doesn’t go flat because it is bottle-fermented (and basically has more CO2 than tanked Prosecco). Like most wine, most Champagne gets a dose of potassium metabisulfite before the cork closes it. That keeps the world from drinking vinegar (and does not cause headaches: read here). But open a bottle and you smell burnt matches. Decanting gives a chance to let the sulfur blow off. Then the various aromatics inherent in the wine can shine. Now this really regards Non-Vintage Champagne. NV makes up most of Champagne’s production. It is also cheapest because it is young: spending the least amount of time aging in bottle. The fizz, acids, and tannins are at their most aggressive. All that youth, like a young Bordeaux, needs time to open up. Distracted, we topped our Heidsieck and forgot it in the fridge. After forty-five minutes, we tried it. A fine, casual pearl of bubbles drifted upward. Aromas of lemon tart remained. But the matches were gone. Now kiwi, ginger, and baguette shined. The popping acidity persisted, as did flavors of lime and lemon pith. But it tasted juicier, with a light strawberry (tell-tale pinot), baker’s yeast, and chalk. 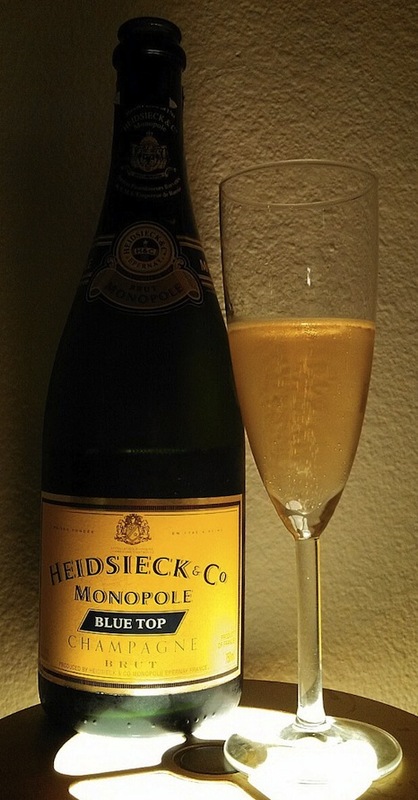 Our Heidsieck could never be outstanding, but it tasted a far sight more complex, interesting, and pretty good (4 of 5). For New Year’s Even, we’re not suggesting a huge song and dance with the decanter. You don’t want guests to think you’re mad. Hell, don’t even decant it. Just open it in secret at least a half hour before the ball drops. Yes, you can’t impress (or impale) your friends with a timed, rocketing cork. But your splurge on NV Champagne will taste as good as it could. This entry was posted in Uncategorized and tagged 2014, Blue Top, Bordeaux, Brut, Champagne, France, Heidsieck & Co Monopole, New year, Non Vintage, Paris, Prosecco, Sparkling wine. Bookmark the permalink. Very interesting! Decanting Champagne? Who would’ve thought? I don’t drink Champagne all that much, but I never had that sulfur sensation – might be just my insensitivity to the sulfur though…Will have to try decanting Champagne- should eb an interesting experiment! Happy Holidays! Sulfur is a tricky thing to notice. I often confuse it for “minerality” or “toasted oak”. The only way I can tell is to smell the wine immediately on opening, then revisit it a bit later. Whites and rosés tend to show it more notably at first. Great advice! Does either “airing” method impact a Proseco or Asti? It will probably ruin Prosecco or Asti. They are tank-secondary-fermented, which means they have less integrated fizz at bottling, and thus will go flat if left open. This advice is really only for Non-Vintage, Methode Traditionelle wines like Champagne, maybe Cava, and a few New World wines.